Large-breed dogs such as Great Danes, Dobermans, German shepherds, standard poodles and boxers are at risk for bloat. (MNN) -- I've been reading about bloat and realized the existence of this condition is not common knowledge -- yet it can be fatal. Fortunately, there are measures that pet owners can take to help protect dogs from bloat, also known as gastric dilatation and volvulus (GDV). Bloat occurs when a dog's stomach fills with gas or air and flips on itself, cutting off circulation. Typically, this life-threatening condition occurs with large dogs. Doctors don't know what causes bloat, but Monroe says that certain attributes can increase your dog's chances of developing the condition. Large-breed dogs with deep chests -- such as Great Danes, Dobermans, German shepherds, standard poodles and your beloved boxer -- particularly are at risk. She also notes that the condition also is more prevalent among older, male dogs. Since gulping down food can contribute to gastric issues, dogs that eat one meal a day or tend to inhale their kibble face a greater risk of developing bloat, Monroe says. Elevated food bowls also may increase risk. If you have invested in a fancy elevated set for your pooch or if your pet has a tendency to inhale its food, Monroe suggests placing a tennis ball in with the food bowl. "You are trying to prevent them from gulping air while eating quickly," she says. "Also, try feeding the dog small meals several times a day rather than one large meal." Slow-feed dog bowls also make it harder for dog snouts to dig in, so scan your local pet store for variations on the theme. Head to the veterinarian if your dog's abdomen suddenly appears larger or if your pet has unproductive retching, Monroe says. Other warning signs include pale gums and excessive drooling. Initial treatment involves stabilizing the dog, administering IV fluids and decompressing its stomach to remove some of that gas. Veterinarians also perform a procedure called gastropexy, which involves tacking the stomach to a wall of the dog's abdomen. This helps prevent the stomach from flipping. "Twenty years ago, the survival rate was 25 percent," Monroe says. "With surgery and care, especially if treated early, about 80 percent do pretty well." 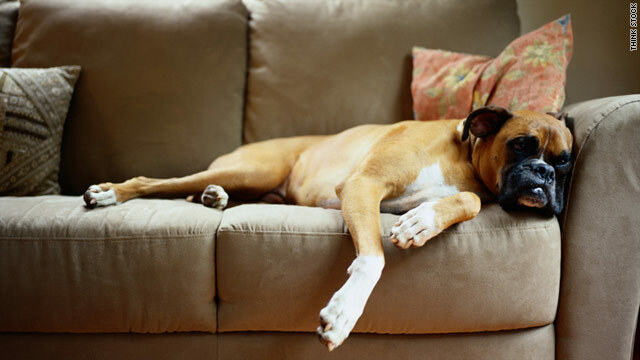 Post-surgery, dogs require limited exercise for about two weeks. If you have an at-risk breed, Monroe suggests that dog owners take proactive measures and opt for the gastropexy during a neuter or spay procedure. "It can really save the dog's life."